With luxuriant green stillness, diverse ecosystems, a home of rare one-horned rhinoceros and a place like Majuli, the world's largest riverine island, Assam which is synonymous to fine and strong tea, is not only a beautiful abode of multi-ethnic societies with different spoken languages along the valleys of the mighty Brahmaputra on the north and Barak river on the southern side, but also rich for its legendary cultural heritage like Bihu. Usually, it is used to say that the word Assam is derived from the Sanskrit word Asama, meaning peerless. Some say that it comes from the word Ahom, the Thai rulers who controlled Assam's destiny for the eventful 600 years and established a greater Assamese fraternity. The important aspect worth to mention is that the Bihu festival is celebrated by the entire Assamese community irrespective of caste, creed, religion, location and of course the ethnic diversities as a National Festival of Assam. The Bihu is full of joy and it is beautiful. The breathtaking Bihu songs are very sweet and when the winds of Bihu flow the valleys of Assam come alive with the sound of Bihu which stimulates the spirit of dancing and rejoicing. The Bihu festival marks the change of season and it is observed thrice, such as, Rongali Bihu or Bohag Bihu, Kati Bihu or Kongali Bihu and the last but not the least Magh Bihu or Bhugali Bihu. There are three distinct phases relating to Bihu of the farming calendar of the native crop of Assam i.e. paddy. The festival of merriment, Rongali Bihu or Bohag Bihu marks the New Year in Assam and also marks the advent of spring the seeding time. The Kati Bihu marks the completion of sowing of paddy and transplantation of saplings and finally Magh Bihu marks the culmination of the harvesting period. Rongali Bihu derives its name from the Sanskrit word Vishuvam, meaning vernal equinox, when day and night is of equal duration. Moreover, the word 'Rong' denotes joy in Assamese. 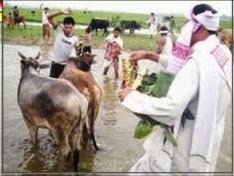 At the time of Rongali Bihu people welcome the spring season and pray for a beautiful and rich harvest. 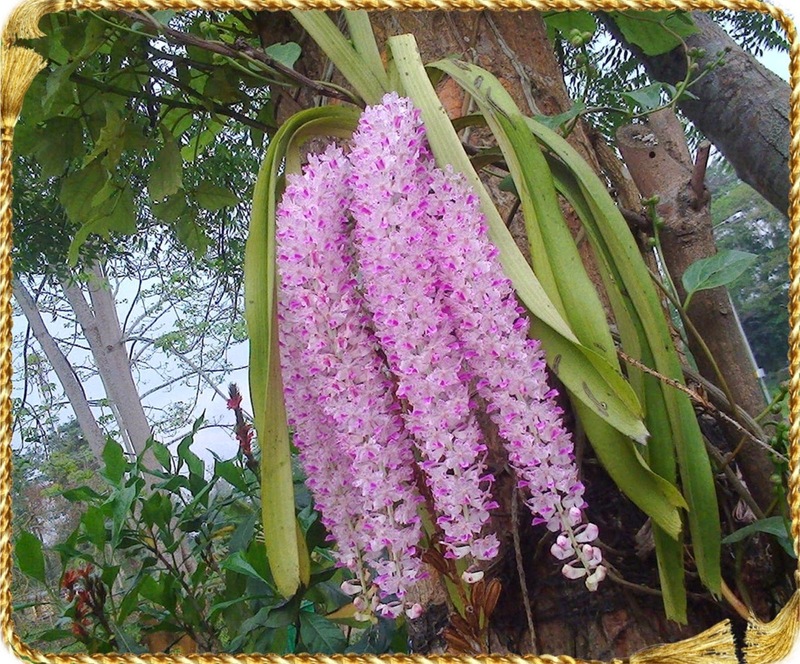 It falls in the first month of Assamese calendar called Bohag. This corresponds to mid-April according to English calendar year. The first day of Rongali Bihu is celebrated as Garur Bihu also called Uruka which falls on the day of sankranti and is devoted to the cattle and livestock, particularly to cow. The rationale behind the worshipping of cows is that they are the greatest asset of a farmer, because not only do they produce milk, but also help plough fields and allied works. The following day is the Manuhor Bihu or the Bihu of human beings and this day is celebrated as the first day of Assamese New Year. People exchange greetings of good wishes each other and invite to partake of the meal and traditional delicacies such as pitha ' made from rice and coconut, laddo ' made from shredded coconut and till-laddo ' made from sesame seed. As the nature gets adorning with green attire, people also wear colourful new clothes during this joyous Rongali Bihu. Everyone generally receives gamoc-ha. Gamoc-ha is a traditional Assamese hand-woven cotton towel with red-designs with a white background. Womenfolk look graceful with the dress of riha-mekhela ' indigenously woven with the golden-coloured muga silk. As Assamese women are expert in weaving, they love also dancing Bihu. Adorning hair with kopoful (orchids), bracelet, gumkharu on hands and dressing with lovely muga riha-mekhela, the young lasses blend the hues of nature, spreading joy and cheer around. People cannot wait for dancing for a moment too just after hearing Bihu songs and sound of dhol (drum), pepa (made of buffalo horn), toka (made from bamboo) and gogona (made from bamboo and held between the teeth). Husori is one special kind of devotional song which is performed during Rongali Bihu by the traditionally attired vivid Assamese youth through dancing and singing with traditional instruments visiting from house to house, in praise of the Lord Krishna, invoking his blessings for good health, wealth and happiness. In a Husori team people of all age groups can participate and the Husori songs are special in kind and quite different from the Bihu songs sung in the open ground called Bihu Toli. On the other hand, Bihu songs are symbolic communication of love and romance among the young boys and girls and the dance is accompanied by folk instruments like dhol, pepa, gogona, toka, taal, etc. 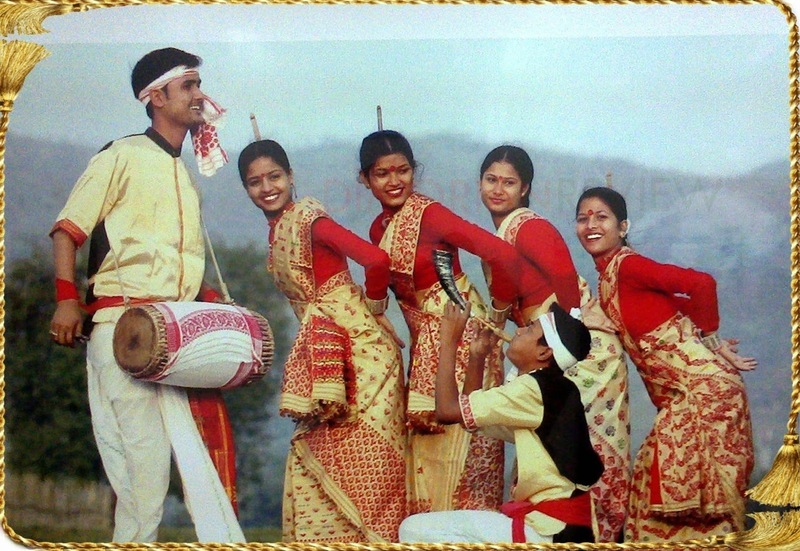 The disclosing fact is that it is not necessary to learn Bihu dance systematically. 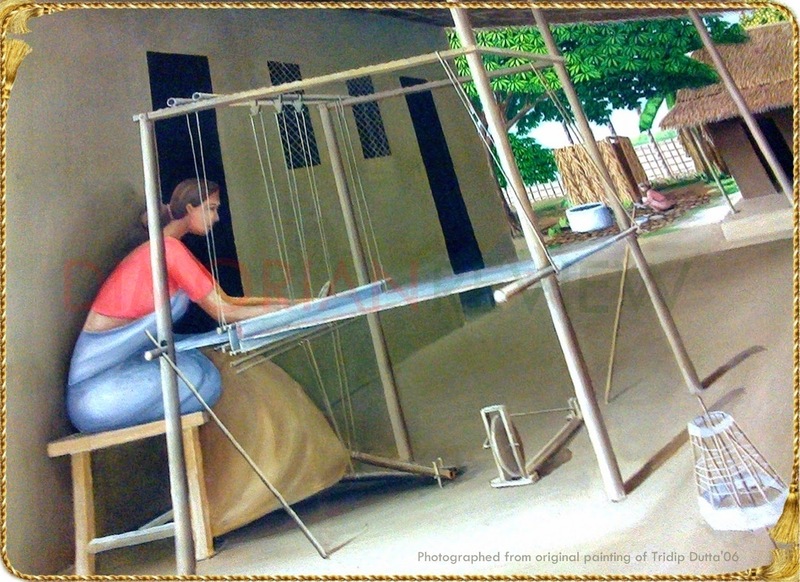 It is inheritance and therefore, Bihu is a folk culture. 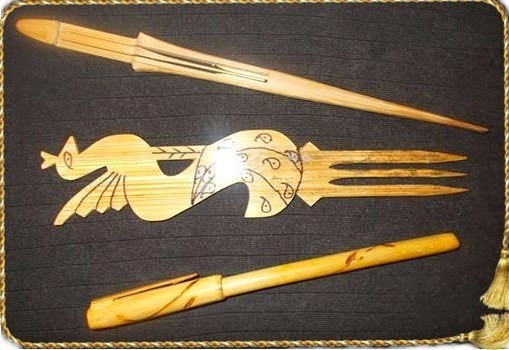 Handmade items used by Bihu dancers (Girls). Traditionally, Bihu has been celebrated with Bihu dance and songs in the village fields. Again, groups of youth go from house to house for dancing and merry-making. The same practice slowly gets transformed to community functions either on the stage or in the open field which appears now as a very competitive passion in nature. As time is passing by, the outlook of the society towards its culture and traditions is turning to be moderated and Bihu is also not exceptional from getting such influence. Now Bihu is going to know globally, particularly its magnificent dance form. To keep this trend going unique, one thing is to be drawn into attention for all concern that the Bihu as a folk culture of Assam, people should try their utmost care for upkeeping its traditional form so as to celebrate Bihu as signatory to Assamese culture and Life Line to Assamese people which is perhaps not replaceable.